I really wanted to do a water marble, but the blue is fast dry...and that is a recipe for heartbreak. 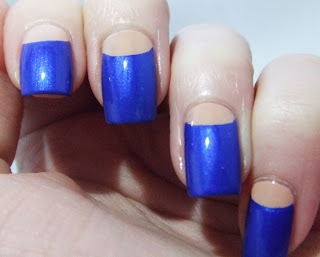 I might still try it, and use a matte coat+clear coat instead of colored polishes. We'll see. I was pretty happy with the color combo. I had trouble getting my moons straight though, and I always do. I need to get some french tip guides instead. The little circle reinforcer thingies I use just dont work for me. It looks awesome, and captured the drama of the dress perfectly! Beautiful!